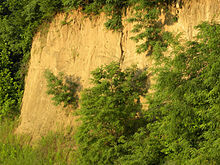 Loess in Vicksburg, Mississippi, USA. Loess is a clastic, predominantly silt-sized sediment, that is furmed bi the accumulation o wind-blawn dist. ↑ Frechen M. (2011). "Loess in Europe". Quaternary Science Journal (EuG) 60(1): 3-5. doi:10.3285/eg.60.1.00. This page wis last eeditit on 14 Februar 2018, at 00:25.